Wahanna Marsh has the distinction of being the first property acquired by the land trust. That was in 1991. Now it was June 2012, and I was about to become one of our first land stewards. As it turns out I’d been to this place before. When I was a kid this was the Olson’s farm. In fact, back then it was nothing but farms out here. Locals used to call the area Bear Valley. Now, as I looked out from the road instead of a farm, I saw a huge blackberry hedge and then a thicket of willows and alders, and then some ponds. There didn’t seem to be any way in, which was more or less true. This didn’t seem to matter to [NCLC’s land steward] as we scrambled down the roadside bank into a thick mass of brush and stickers. We picked our way though and finally staggered out into a sea of big clumpy, marshy grasses up to my chest with holes and ditches filled with water waiting to be stepped into. We headed out into the center of the marsh to a small bushy tree and stopped. This was the designated photo point for this reserve, out in the center of what to me was a very alien place. I considered myself pretty good at native plants after a lifetime of walking in the woods, but this was different. I hadn’t really been anywhere like this since I was a kid. I remember we walked around mostly looking at the invasive plants. Then we waded through a pond and staggered back out through the giant blackberry hedge that ran along the road. It was going to take me a while to get used to this. That’s for sure. But now I’ve been out here for more than five years, and all that has changed. This really is my little marsh. The stewardship for this property is listed as “protection”: not needing major enhancement. I think the idea would be to keep it in good shape without having to schedule any work parties. 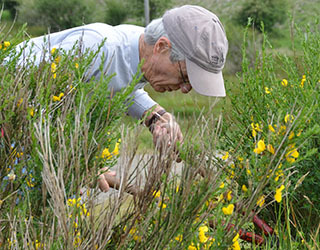 It’s not really required for site stewards, but there’s always something that needs doing, a little ivy to pull, holly to cut, reed canary grass to measure, a small patch of Scotch broom to wrestle. What’s interesting about this place is that it’s not a natural wetland being invaded by human development, quite the opposite. It’s an old farm slowly becoming a beautiful tidal marsh.